It’s odd to begin a restaurant review by referring to another restaurant that I haven’t been to and that has closed entirely. But bear with me, as there’s a reason behind my madness. Barullo isn’t just a new Spanish restaurant in the City, within spitting distance of both The Gherkin and The Can of Ham. It also effectively replaces one of chef proprietor Victor Garvey’s other restaurants in Covent Garden. Eschewing a restaurant in thronging tourist land for one in a part of town that’s effectively deserted at weekends is a gutsy move. Barullo uses all this to its advantage though. While it’s closed on weekends, giving its hard-working staff something as close to a 9-to-5 week as they’re ever likely to get in the hospitality industry, it will also start delivering meals via Deliveroo in May. While the delivery radius will only be around a mile, the sheer volume of hungry office workers chained to their desks within that coverage area is a potentially lucrative one. Whether this strategy really will deliver meals to City boys, a work-life balance for Barullo’s staff and a decent chunk of change for Garvey remains to be seen. What is certain, however, is that Barullo’s kitchen is not short on skill or sophistication. The first hints of Barullo’s skill with seafood manifested itself in the paella marinera that I shared with the Happy Buddha and Kangaroo Face. The quivering, delicate prawns were worthy of a spendy Japanese kaiseki meal, evoking the brisk salt air of the seaside in a visceral manner. The briney mussels were almost as potent, with only the so-so squid letting the side down. The medium-grained rice was, underneath its browned crust, amber yellow from saffron, although it wasn’t as fragrant as I would’ve expected as a result. Even so, it provided plenty of ballast with the thick, punchy aioli on the side picking up the saffron’s slack. My only real complaint was that I wish this paella was available in smaller portions. While it was fine sharing with two other people, it’d be a struggle to finish for just a couple and impossible for a lone diner. And for someone as rapaciously hungry as I am, that’s saying something. If only this paella were available in variable-sized portions. Everyone would then be able to enjoy this paella, not just medium and large-ish groups. 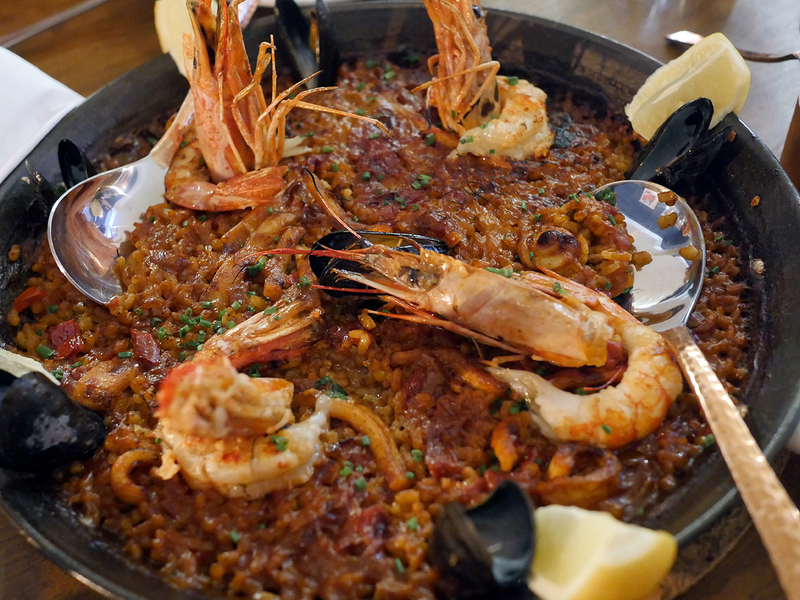 It’s far too easy to become blasé and dismissive about tapas in London, given the rather uneven quality at the capital’s other, overhyped tapas restaurants and Barullo’s own rather uninspired menu writing. Barullo’s tapas should not be underestimated though. The lightly smoked mackerel began with a bang, its potent smokiness eventually levelling out into a more genteel drumbeat that nevertheless emphasised and enhanced the the distinctively bold taste of the mackerel. 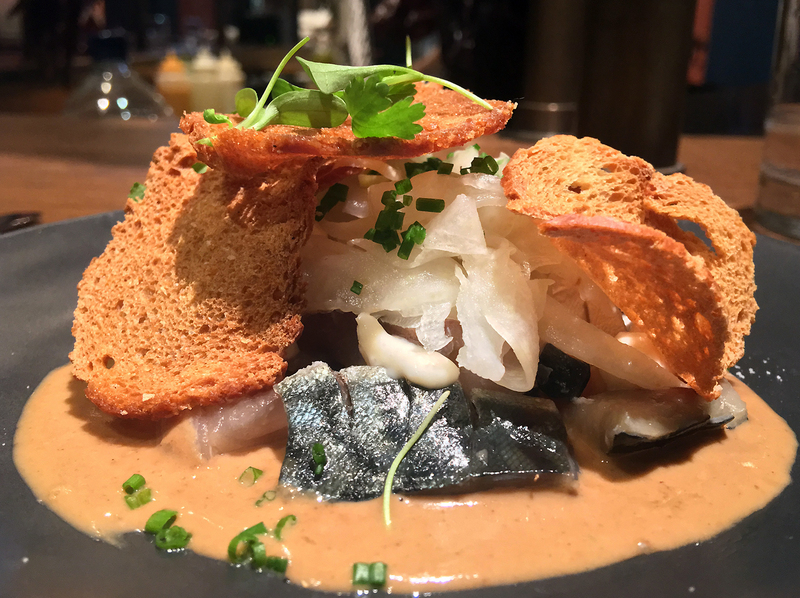 The meaty, chewy strips of fish had a salty umami, while wide yet thin strips of sauerkraut-esque pickled vegetables provided a counterbalance to the vivid richness of the fish. Only the so-so crispbreads let the side down. If this is lightly smoked, I’d love to see Barullo’s version of strongly smoked! An alternate version of this dish used tuna instead of mackerel, but was worse off for it. While the strips of glossy chewy tuna were just as texturally pleasing, its less distinctive taste meant there was nothing for the smokiness to interact with – a Torvill without a Dean, if you will. It all just felt incomplete. At least the useless crispbreads had been replaced with sev-like flakes, although that’s small consolation. I might be giving away a hint to my age there, with that ice skating reference. Oh well. 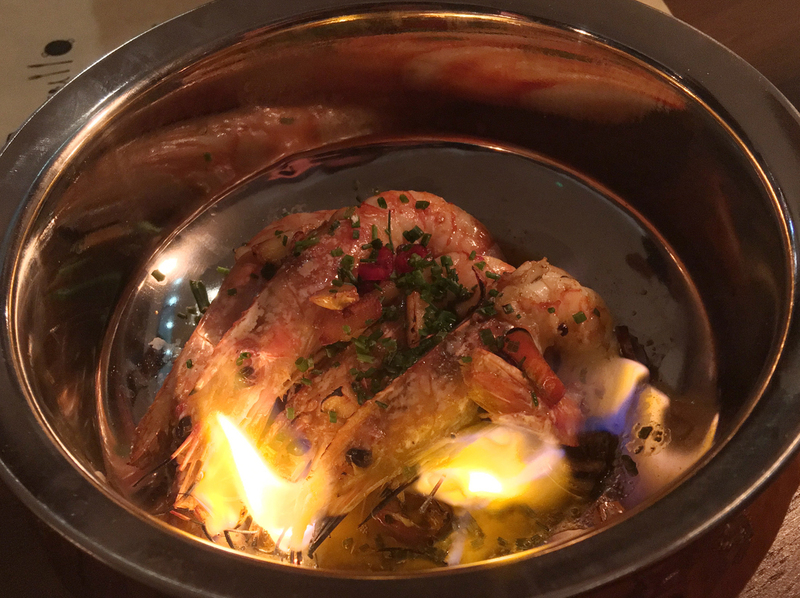 Prawns flambéed tableside were just as good as the crustaceans that crowned the paella. The prawns were cooked just-so with an amaebi sushi-like sweetness coarsing through their delicate, quivering little bodies. The umami and gentle spicing of the sauce complimented the prawns, rather than overwhelming them. The deceptively simple charms of this dish were utterly beguiling. These gambas were no gamble. It’s a rare dish that includes turbot and yet puts that often superlative fish in a corner, but Barullo’s take on turbot did exactly that. While the turbot was cooked just-so, it wasn’t the main attraction. It proved to be a mere conveyor for the nuanced, layered sophistication of the sauce. Earthy, milky and umami with a gentle floral fragrance, its addictive qualities were boosted further by the wrinkly, musky morels. This dish stunned myself, Happy Buddha and Kangaroo Face into reverential silence. I suspect the kitchen could possibly get away with using a cheaper white fish in the turbot’s place. But I wouldn’t like to say. Barullo’s take on octopus lacked the springy bounciness I’d prefer, but the chopped tentacle still managed to successfully evoke the sea. Even so, with its mouthfeel compromised it was ultimately overshadowed by its accompaniment. The potato puree wasn’t just a fluffy heap of carbs, but one infused with fragrant saffron and a nutty, malty sweetness that was almost reminiscent of cornflakes. 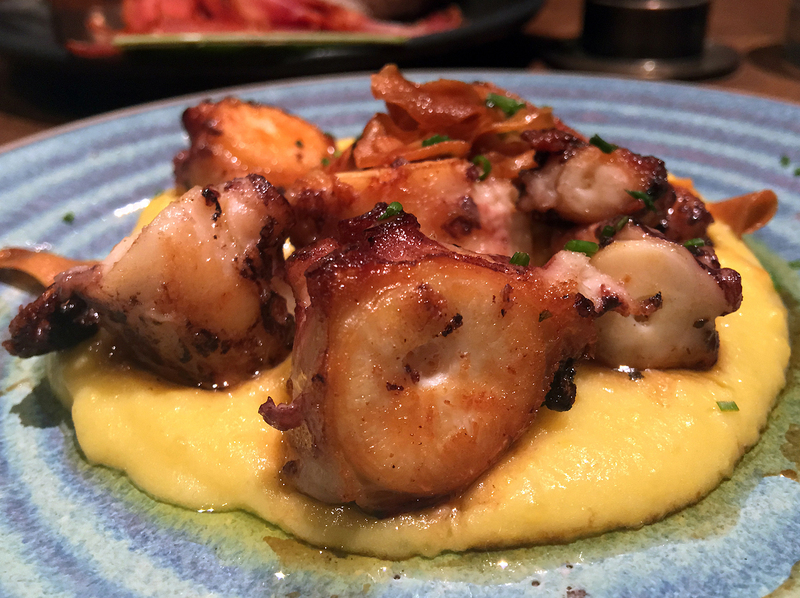 It was intensely bewitching, far more so than the octopus itself. Taters on the bottom, but they come up tops. Fried oysters were far from bad with a crisp exterior and a briney bittersweet followthrough that, surprisingly, was complimented by the creamy dressing rather than overwhelmed by it. These oysters just about managed to avoid falling into the oysters Rockefeller trap of overwhelming the natural charms of the molluscs with a fussy dressing, but only just. These didn’t rock my fella. 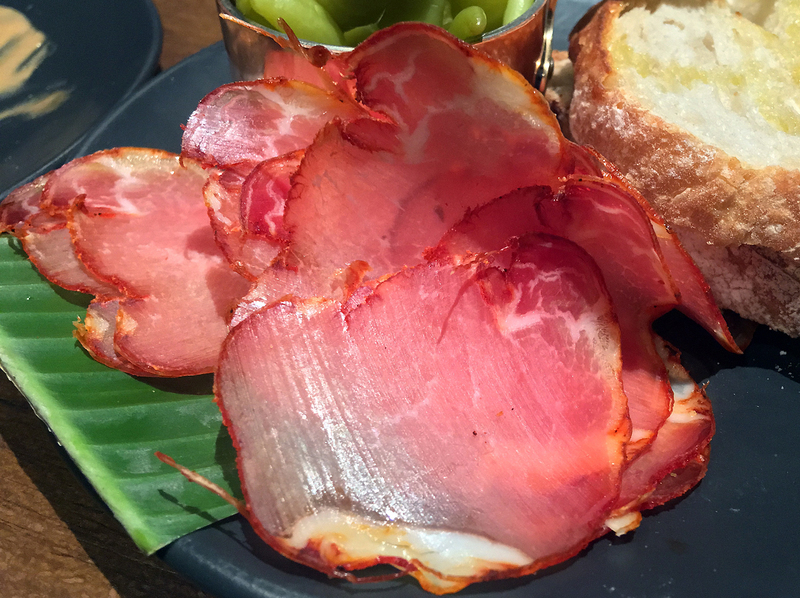 Despite their thinness, slices of lomo iberico were dense and meaty with an apple-like sweetness and a subtle heat. Those qualities were obscured somewhat by the crunchy bread brushed with a slick of olive oil. Still, the cured pork itself was a delight. Mild pickled chillies were served on the side as a palate cleanser. 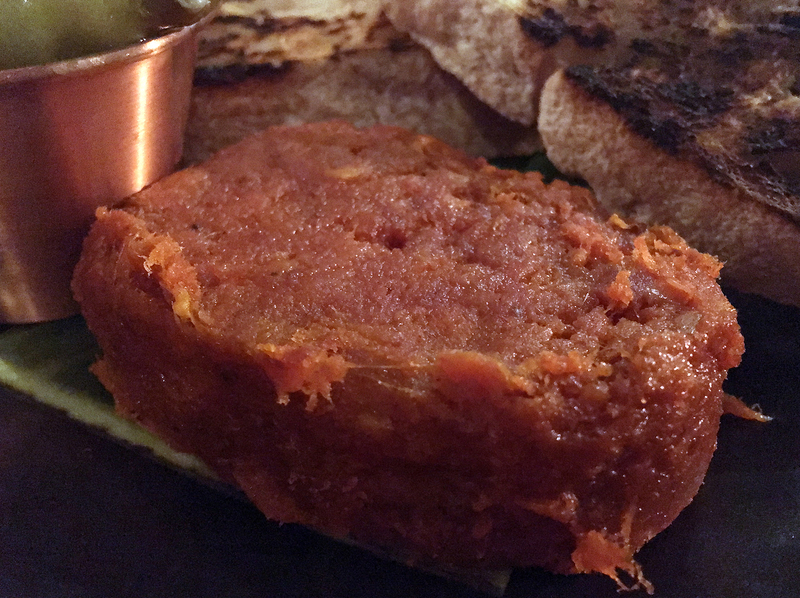 Thick pâté-like sobrasada spread onto bread smoothly, yet retained its dense meatiness with a paprika-like warmth to it. It wasn’t quite sumptuous enough to displace Gorronnaise rillettes from my meat spread affections, but it wasn’t that far behind either. For better or worse, Barullo doesn’t seem to attract hoards of City boys flatulent with testosterone. 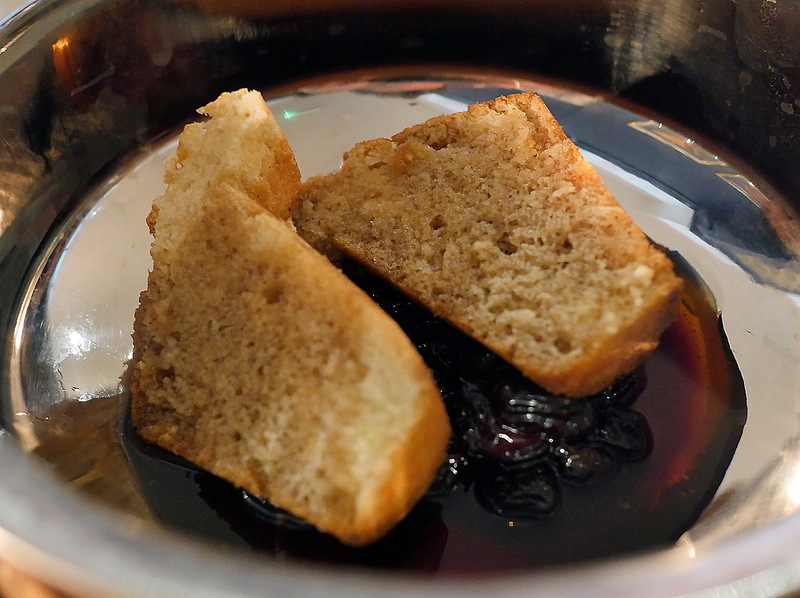 Fuet was by no means bad with its fatty, fruity sweet and lightly garlicky charms. 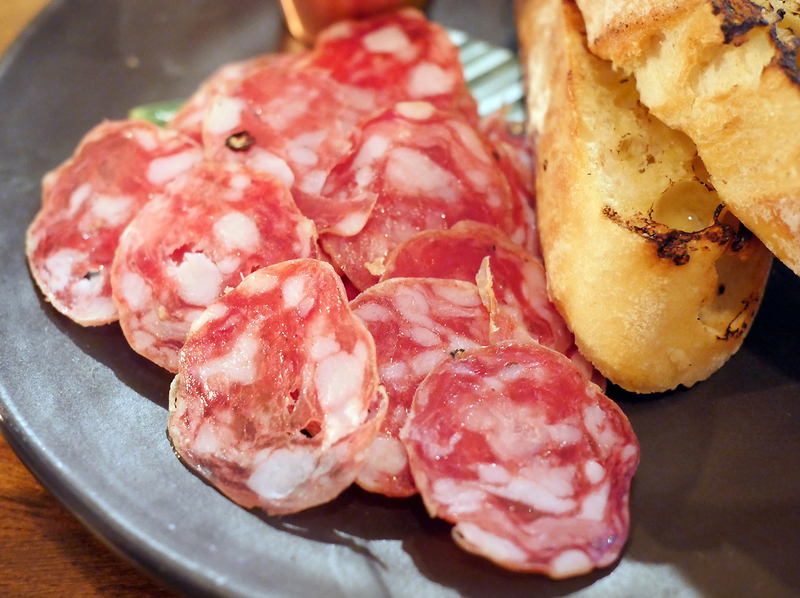 It just paled into comparison next to Barullo’s other charcuterie options. A plate of mushroom croquettes doesn’t sound especially interesting, but these little morsels should not be overlooked. 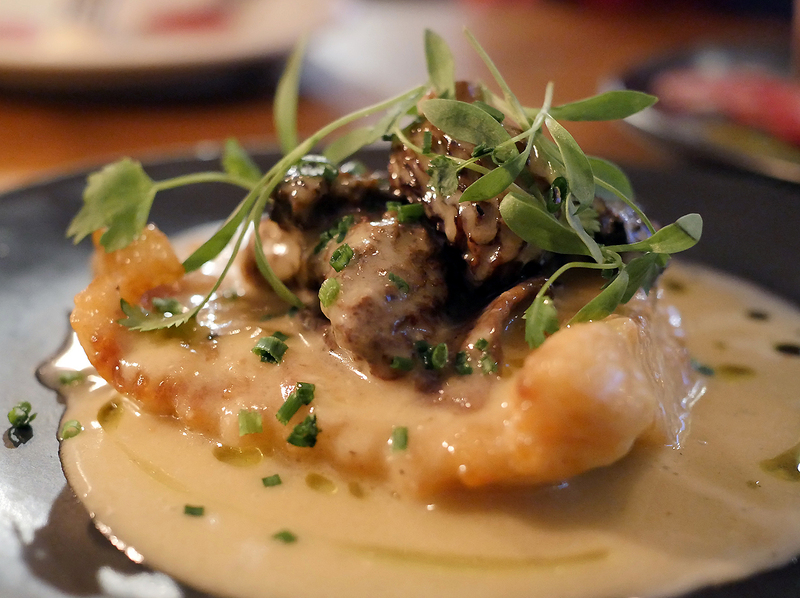 Beneath the crisp, oil-free exterior was a creamy, earthy filling that tasted more of mushrooms than some whole, extant mushrooms I’ve had at other restaurants. 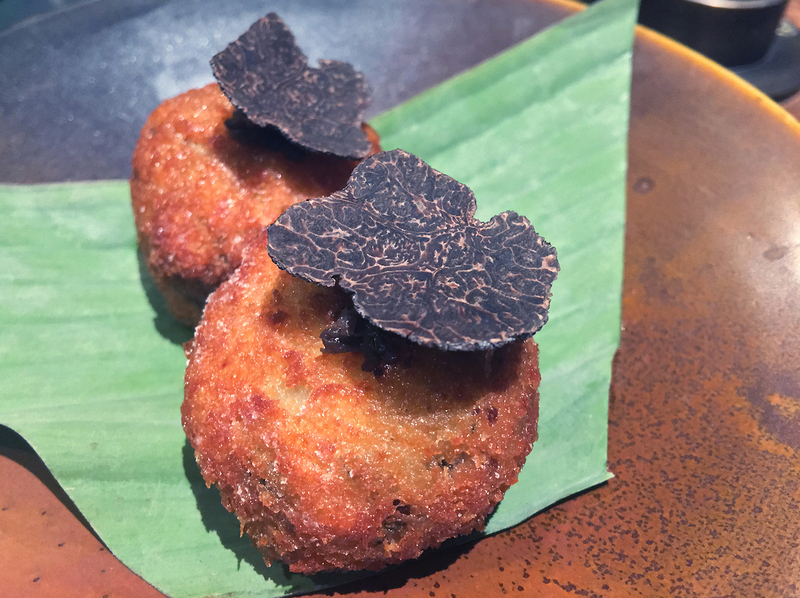 With this potent evocation in place, there was little need for the slices of truffle perched on top – especially as they had surprisingly little aroma. The non-vegetarian croquettes had the same grease-free shell, but filled with a mixture of suckling pig meat and smoked cheese that blended together almost seamlessly. The cheese was neither too thick nor too cloying, melding naturally with the sweet, fatty unctuousness of the pork. 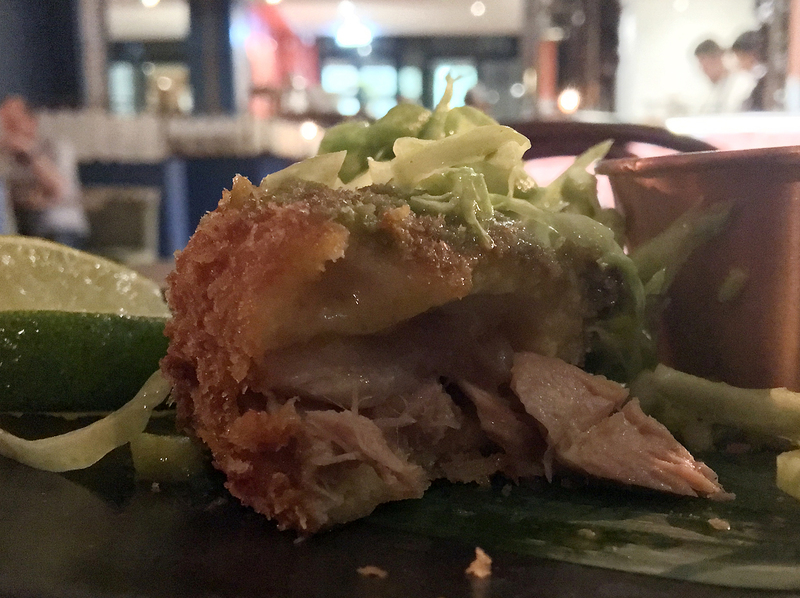 It may ‘just’ be a ham and cheese croquette, but it’s nothing if not the exemplar of its kind. So not kosher. Which is somewhat ironic given that London’s oldest surviving synagogue sits almost immediately across the street from Barullo. Barullo’s kitchen seems to have a fondness of pairing pork and cheese inside a crispy vessel and I’m certainly not complaining. 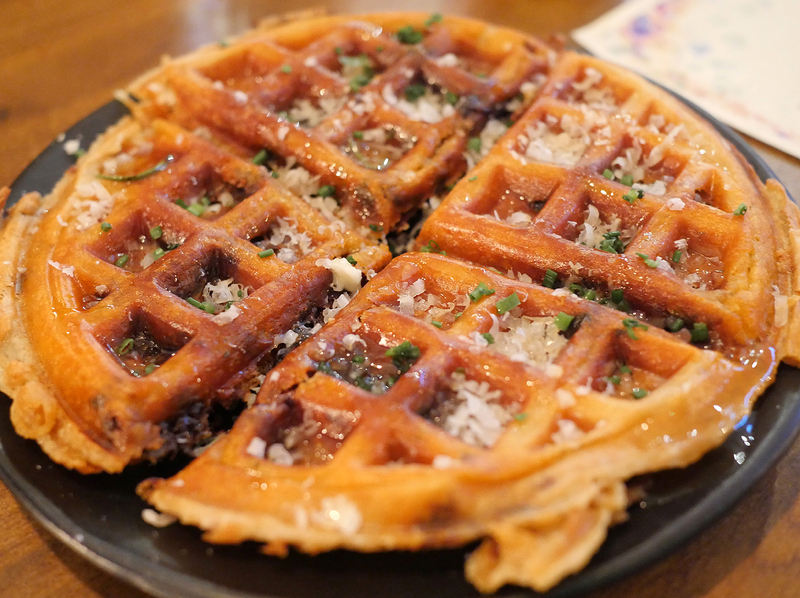 A thin, crispy waffle came filled with morcilla and cheese. Its charms proved to be more understated and elegant than the suckling pig croquettes, but no less winsome. While crispy on the outside, it sliced open to reveal an airy interior oozing a musky, smoky blend of morcilla and cheese. A touch more aroma to the rosemary honey drizzled on top would’ve been the perfect finishing touch, but this stuffed waffle was still immensely enjoyable as it was. I hope I’m not waffling on. 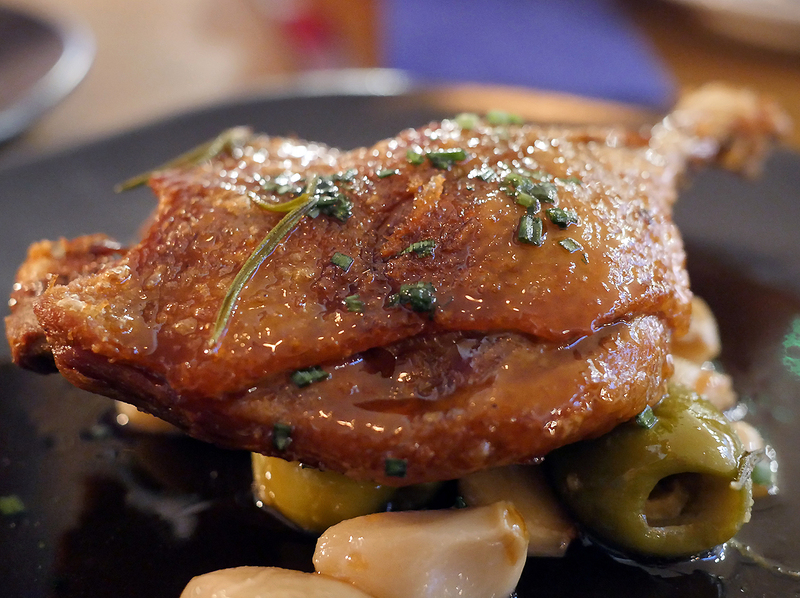 A tender and lightly fatty leg of confit duck was elegantly well-executed, accompanied by plump olives and remarkably well tenderised cloves of garlic. While perfectly enjoyable in its own right, it’s in danger of being overshadowed when taken with some of Barullo’s more strident dishes such as the waffle or turbot. I’m confit-dent enough to waddle out onto the street in my glad rags even after stuffing my face at Barullo. 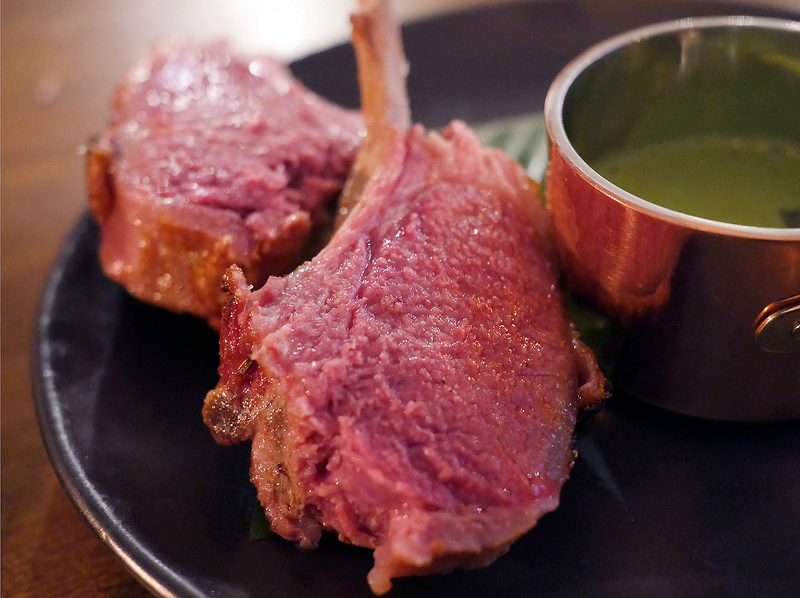 Lamb chops come as a pair on a plate. Somewhat disappointingly, Barullo’s friendly but still somewhat scatty staff weren’t smart enough to recommend upsizing the portion – we’d happily have paid a little more to ensure each diner had a chop to themselves. While tender, rosy pink, occasionally rimmed with strips of well-seasoned fat and served with a lightly zesty sauce on the side, they were ultimately too subdued to replace the exquisite lamb chops from the nearby Gunpowder in my affections. The perils of using a dedicated camera – having to Photoshop your reflection out of utensils in a futile attempt to preserve one’s anonymity. Like Pokemon, the desserts at Barullo have evolved almost before my very eyes. Coconut ice cream with sour cherries is one example. On one occasion, smooth, light and distinctly flavoured ice cream had its coconut flavour helped along by shavings of extant coconut. 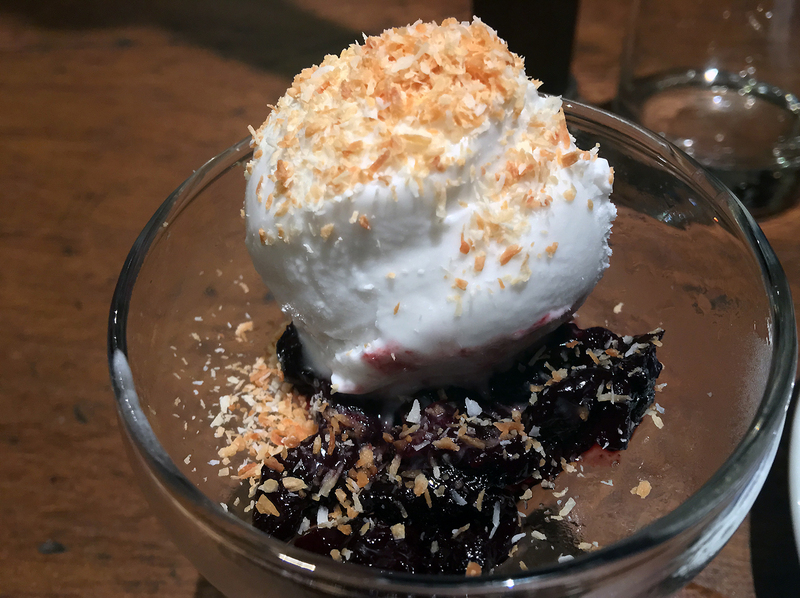 Kirsch-style cherries were surprisingly tame at first, but the refreshing ice cream boosted the sour sweetness of the boozy fruit albeit at the cost of its own coconut flavour. Enjoyable, if a little disjointed and unbalanced. There are no sour grapes here. Just sour cherries. This dessert arrived in revamped form on a subsequent visit. The cherries were far more sozzled and accompanied by airy yet stodgy slices of bready sponge, while the ice cream remained unchanged. While heavy, the trio of fruit, carbs and ice cream proved to be unexpectedly winsome in a blotto Christmassy sort of way. Ice cream just out of shot. Barullo’s crema catalana also underwent some changes, although to a lesser extent. 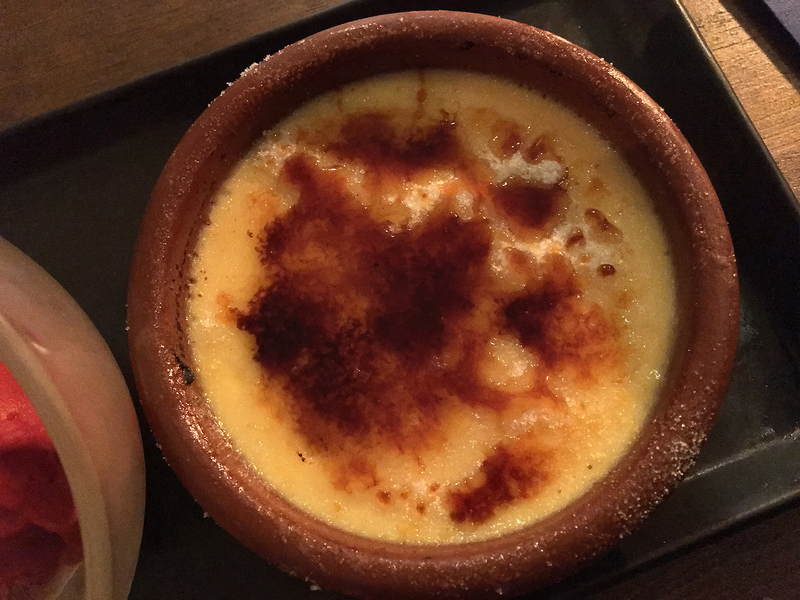 In its first iteration, the crema catalana arrived in classic form with a crunchy burnt crust shattering to reveal an intensely eggy creamy pudd that coated one’s mouth. 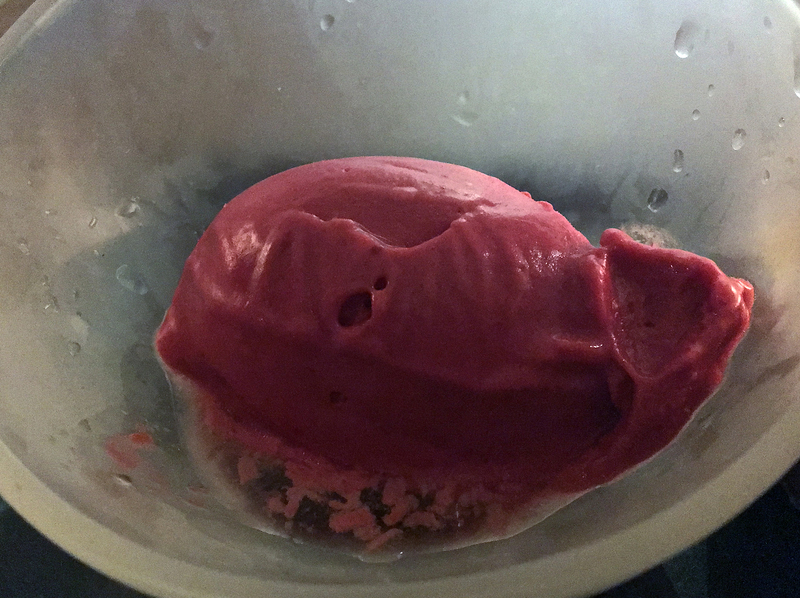 Raspberry sorbet was served on the side. While only reasonably true to the fruit, its smoothness and refreshing briskness made it perfect for palate cleanser duty. Food prepared with care, attention and skill shouldn’t just be for the upper crust. In its second iteration on a subsequent visit, the burnt crust was almost entirely missing with the sorbet perched on top to my great surprise. 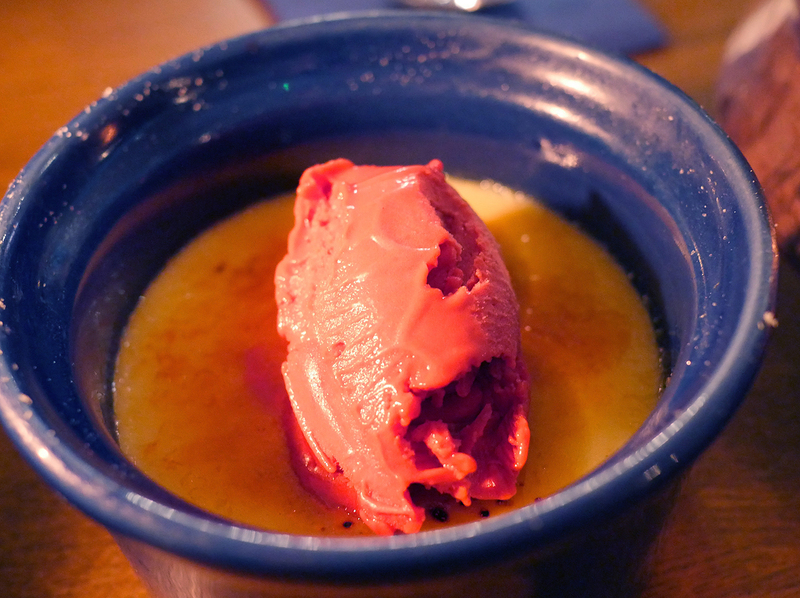 Still, the immense richness of the pudding and the bracing refreshment of the sorbet were as delightful as ever. The new version also helps save on washing up, I guess. 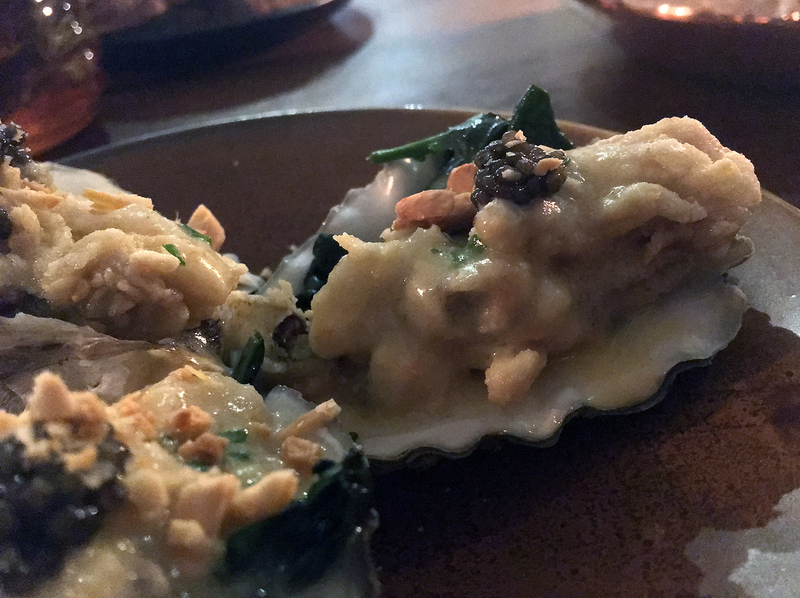 Barullo came close to securing the first Five Star award of 2019 on this site, but wobbles in some of the dishes (most notably changes in the lightly smoked fish) and the hesitant, unpolished service means it’ll have to do without. Even so, Barullo should be far more popular than it currently seems to be – its sassy, sophisticated and vivacious style of cooking means it towers above many of the other tapas restaurants I’ve been to in London from the Brindisa empire and Copita to Sabor. Longtime Twitter followers will know that I regard Deliveroo and its business model with even more disdain than estate agents, but if it can help a restaurant as thrilling as Barullo thrive then it may yet be able to justify its existence. 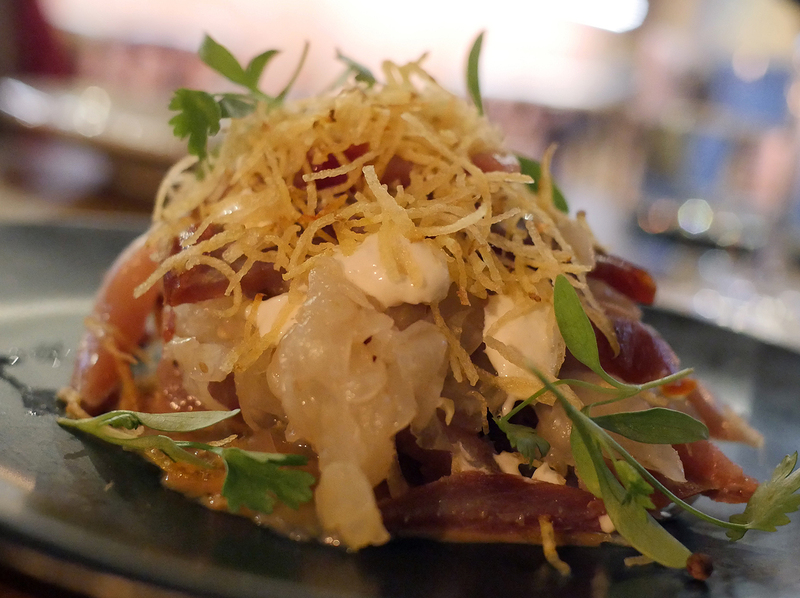 If there is one London restaurant that can single-handedly reignite your passion for Spanish food, then it’s Barullo – it certainly did the trick for me. Opening Hours: Monday-Friday noon-22.30. Closed weekends. Average cost for one person with soft drinks and service charge: £40-45 approx. Tags: barullo, charcuterie, cherries, chops, confit, creme brulee, croquettes, duck, fish, ice cream, lamb, london, mackerel, octopus, oysters, paella, prawn, prawns, restaurant, review, tapas, tuna, turbot, waffle. Bookmark the permalink.